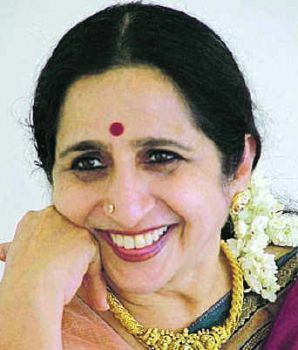 Indian singer Aruna Sairam is the most sought-after vocalist of Carnatic music of South India today. Her concert appearances regularly sell out – be it Chennai, or Paris – attracting record crowds that create “traffic jams around the auditorium.” She straddles the national and international music worlds with equal ease and popularity. Her panache for innovation has brought her accolades as a trail-blazer in Carnatic music. Sairam was born in Bombay – a city whose rich cultural life embraces the majority of India’s artistic fields – into a family with a deep love of music. Her mother, the singer Smt. Rajalakshmi Sethuraman, was her first teacher in the art of Carnatic music, while her father, a knowledgeable connoisseur, established their house as a favorite stop-over for the greatest musicians and dancers from both Northern and Southern India. It was in this propitious atmosphere, which was fundamental to the development of her art, that Aruna Sairam trained with some of the most outstanding figures in Carnatic music. Drawing on her long concert career and a number of significant encounters with other great musicians, Sairam is now recognized for her own style. Her voice is a beautiful blend of resonance and range. It has an unusual timbre which gives it uniqueness. Add to this the musical legacy rooted in the traditional classicism of her gurus, as well as her own openness, and you have Aruna Sairam. She has created a large Western audience for Carnatic music and she often performs in dialogue with internationally renowned artists from Europe and Africa. The deep emotional impact of Sairam’s music intensely moves her listeners and has deservedly made her the favorite of pundits and the public alike.